I considered looking at the main Ars Magica book from this bundle, but I decided that I was looking at enough core rulebooks as it was. Instead, I thought this book here would be interesting, featuring different stories of fairies and mystery for the Ars Magica characters. My hope was that there might be some interesting ideas that could be used in other game systems, or maybe provide information for writing. I hadn’t really expected that what I got was a book of scenarios to run in Ars Magica. Ah, well. The book features 9 different stories. Each of them is tailored to a specific kind of troupe – the first is aimed at a group of 2-3 magi, while the second is tailored to a group of companions and “groks”. The stories are all independent, and the main factor tying them together is an exploration of the mythical landscape of Europe. Many of the scenarios deal with fairies in some capacity. A number also include references to real historical people and events. The scenarios are described with a short introduction, a brief summary of the central conflict of the scenario, descriptions and stats of the NPC’s of the scenario, and then an “Expected Sequence of Play,” in which the events of the scenario are described as they are likely to unfold. At the end is a sections of the rewards the players can expect to reap from the scenario. Most of them also have a box detailing how to adapt it to other circumstances – so moving the action elsewhere, or getting characters from other places to come into the action. My impression: I chose this in the hope that there would be interesting inspiration for other games. That’s not precisely what I got, though there is some to be gained. 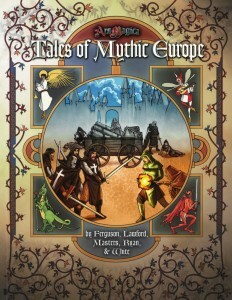 There are certainly some elements that could be adapted to other kinds of games set in “mythical Europe”. The scenarios themselves are not the best examples I’ve ever seen. The structure chosen is not exactly ideal to my mind. The “expected sequence of play” model might well lead to railroading, and the scenarios largely has the players drop into the middle of a situation that is already being played out by opposing NPC’s. I would prefer more focus on the role of the PC’s in the story, and on making it relevant and engaging to the players, not just as a fun story before you go back to your regularly scheduled scenario, but something that actually matters to the players. Still, it’s an interesting example of how you can use history and myths in a game like Ars, and there seems to be some interesting ideas for characters and conflicts in here. How would I use this: I might still pilfer the base structure of one or two of these stories, even if I probably wouldn’t play it exactly as written. And if I ever run a game of Ars Magica (which is a game that has been on my “like-to-play” list for ages), I might well drop my players into one of these stories when I need a jolt of energy, or I feel like taking them out on a little adventure.